Mary-Jane walked slowly along the beach, with each step she stretched out her foot, feeling the gritty, grainy sand between each of her toes. She enjoyed the emptiness and stillness of the coast line at this early hour in the morning. She had crept out of the holiday cottage leaving her sleeping family to enjoy a few more precious hours before they rushed back to their busy lives and their alter-egos in the busy commercial world they all seemed to compete in. She smiled to herself as she recalled the previous night’s events. They were so kind and thoughtful to have arranged a surprise birthday bash for her, although she had had an inkling that something was going on when nobody was talking to her on Facebook. She had embraced the new technology, much to the astonishment of her children and grandchildren, who now had to be slightly circumspect in what they ‘shared’ so that their grandmother didn’t follow an unsavoury thread. They had laughed when she had got it wrong and told Louise, her 18 year old granddaughter that she liked following the cord. ‘No, Nan, it’s called a thread but you don’t have to worry about that really,’ Louise had told her, patting her hand condescendingly. Mary-Jane had shrugged her shoulders and decided to look up the other acronyms she had been wondering about because she didn't want to appear foolish. She came across a wonderful site on Google (that made her cringe) all about urban myth; it was quite fascinating and was giving her an insight in to today’s modern world. There it was. It was still there. 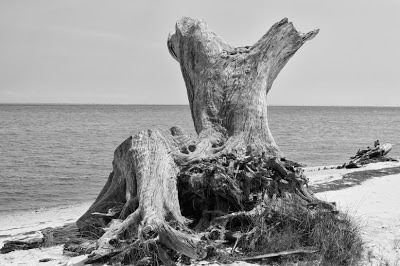 An uprooted tree stranded on the beach, throne like in its singularity, majestic in its downfall. She empathised with the broken trunk, sometimes she felt as though she was discarded, left disconsolate whilst everything crashed around her. She shook her head and dispelled dark thoughts. This was not the time to be maudlin, she should be thankful for all the years she had spent on this earth and hopefully she would have many more to enjoy. She stopped and rested against the fallen wood, its bark rough and showing its age. Her mind wandered off back to the days of her childhood and preparations for birthdays. There was no convenience of preparing well in advance and storing foods in freezers. Her mother had to prepare jellies two or three days in advance and the trifle would take a week to set. Home-made custard was made with eggs and milk not out of a tin! Mary-Jane lifted her eyes towards the cottage. She thought she saw her husband of many years standing on the patio with a cup of coffee in his hand. She thought she saw him blow her a kiss before he turned and disappeared back inside. A single tear fell down her cheek; it was just wishful thinking, knowing that this was another year and another birthday that had passed without him. Aww. :( I liked how even though the beginning was a sort of happy start with the surprise party you built in the suspense of sadness without going overboard with it. Lovely story about the ups and downs of life. Nice work tying in the photo! I join in with this blog-hop as a point of exercise. For some reason there are a few people who like what I write but as is often the case I am my own biggest critic. Reading this brings it home to me exactly why that is. I am a fraud in the respect I have very little imagination and draw heavily on life experience. Like others in the blog hop this post seems so effortless, or natural. I am envious. Awwww,I love this! It's so sad, but you captured it really wonderfully! Good job! I really enjoyed this, Sally. I was swept along with Mary-Jane's surroundings, her memories and her sadness. Although sad, the ending was well done. So very tempting. Maybe I'll post on this next week. Oh wow- that took a really surpising turn at the end! And now I understand why she was having such sad thoughts the night after a lovely event- that seemed sort-of out nowhere when i first read it but then the end brought it together nicely.